Rare Vintage 1964 DR PEPPER Miss Teen American Airlines SIGN & Promo Purse NOS! Straight from the year the Beatles invaded America. Offered for auction is this rare vintage unused 1964 promotional sign and premium sample offered tote/purse. The signage features the Miss Teenage America, Jeanne Zavrel, for the year 1964 holding her trophy and saying " You can be Miss Teenage America, Enter Now". See details on Every Carton". Advertising for the show's owner and main sponsor "Dr. Pepper". Additional sponsors in the blue band on the bottom, "Armour Star Franks", "Lincoln Mercury", and the "Official Airline American Airlines". In a cameo on the left is a "Special Offer" from Dr. Pepper, for a "Genuine Leather Prom-Tote Bag". "A $4.95 value for Only $2.50". Included in this auction is the original, unused, Genuine Leather Prom-Tote Bag that was the promotional go-along given out to stores to display with the sign. It comes in its original white shipping box which has the Prom Tote PO Box, Dallas Texas address. Note, this was never shipped and has no recipient address as it was sent out with the sign directly to a store. The paper sign has never been used and still retains its unused posting peel and stick corner mounts. It measures 20" x 13-1/2". Paper stock. These come from a estate and the original owner who had the sign mylar sealed on cardboard back to protect and preserve its remarkable condition. Its coloring is vivid and bright and it is still in very nice condition with no crease lines, folds, holes, tears or stains. Sign is dated " TA-3 Dr. Pepper Company, Dallas Texas - January, 1964- Litho in USA". The "Special offer" tote bag is made of white leather with metal cone tipped drawstring closier. It measures 7" x 7" x 4". It features the colorful red, white, blue Miss Teenage America logo on the front. The bag is in very nice condition, never used. Leather is soft and supple and is of nice quality. On the bottom it is marked "Justin" "Top Grain Leather". 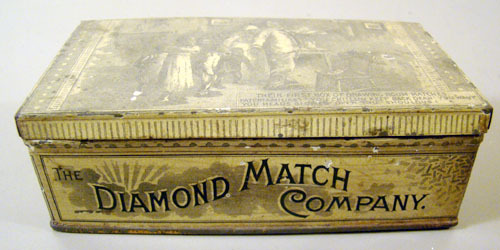 The box is intact however it has discolored over time and has some staining. The original tissue paper packing has yellowed some with age. A rare find from the golden age of Dr Pepper premiums, advertising signage. Interesting Note: The Miss Teenage America Pageant started in 1961. It was a contest for high school girls representing cities (not states). Owned and sponsored by Dr. Pepper the contest was held in Dallas Texas. The pageant contest was aired on CBS television each year in Nov. Dr Pepper discontinued the pageant back in 1977. Dr. Pepper sold the pageant to Teen Magazine in 1981. 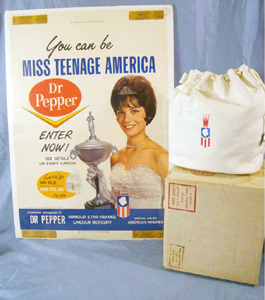 Don't miss out on these historic pieces of Dr. Pepper & Miss Teenage America, advertising memorabilia. BIG Vintage Hibbard Retail Dealer Catalog GUNS FISHING HUNTING TOOLS LURES REELS ! 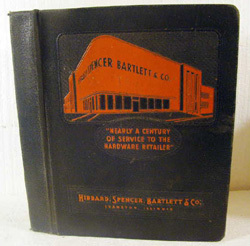 Large, vintage, original, Hibbard, Spencer, Bartlett & Company retailer's hardbound catalog. 2444+ pages. Tabbed sections. Complete, and includes sectional and whole, indexes and order forms. Measures: 11-1/2" x 10-1/4" x 3-1/2". Not dated other then explained HSB would periodically print revisions to be added until Nov. 1. 1951. Profusely filled with illustrations, (some in color), information of all sorts of amazing old vintage products from back in the day. Outstanding sections on Guns -shells, and accessories. Fishing, reels, lures, poles accessories. Camping.Tools -mechanics, carpenter, power tools,etc. Garden supplies- Lawn mowers, sprayers, Builders Hardware - Locks, cabinet hardware, padlocks. Plumbing - fixtures, fountains, accessories. Heavy Hardware. Furniture, Lighting, Cookware, Appliances, Electrical goods, Sporting Goods, Gifts, Dinnerware, Silverware, Household items. Bicycles and accessories. Catalog is in very nice condition. Presents well. Lite signs of age and use, but overall very good. Pages are clean, crisp, free of major damage. No markings, stains, odors. Lots of product illustrations showing packaging/containers/display boxes. Loads of popular name brands, and other little known brands. HSB offered the best! Winchester, Remington, Heddon, Stanley, Miller Falls, along with smaller brands like True Value, etc. A rare find in a vintage post war era retailers catalog. Great reference book for collectors, dealers of vintage 1940's collectibles. Vintage WABASH RR Railroad Padlock Switch Lock Brass Key Obsolete Line Repair Track! This is this old "Wabash" railroad hollow barrel padlock key. Marked "Wabash" on the one side and other has "RT" (repair track) and "Slaymaker" in oval. 2-1/8" in length. Key is in good condition, shows pocket wear, no breaks, cracks or repairs. 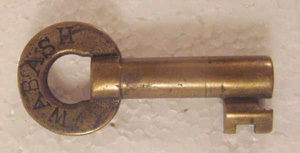 Great obsolete line key for your collection. 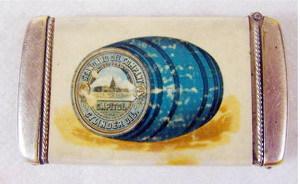 Rare Circa: 1910 Standard Oil Company Celluloid Match Safe, Eldorado Engine Oil and Atlantic Red Oil. Still in very nice condition overall. Complete, intact. No tears to the celluloid covering. Rub wear consistent with age and use. 1-1/2" x 2 3/4"
1931 International Harvester Reaper Brass Watch Fob! Original brass advertising watch fob and leather strap. From an estate where it was a prized possession of its original owner, who bragged that he owned and used one of the first reapers that International Harvester invented. Fob is brass, 1-3/8" across. 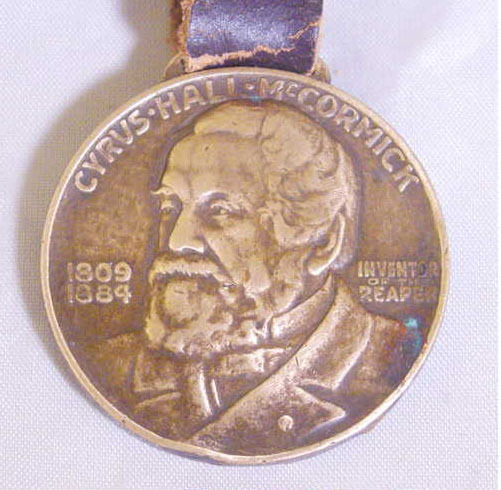 Front has Cyrus Hall McCormick embossed image, Inventor of the Reaper, and the dates 1809-1884. Back features the embossed image of the horse drawn reaper at work, and International Harvester Company around the edge, and Centennial of "The Reaper" 1831-193. Fob is in very nice condition still. Lite signs of age and use. Still sharp on the details. Leather strap is in good condition other then its starting to crack where it goes through the brass loop on the top of the fob. Take a look. Its a pretty unique piece of IH centennial memorabilia that would be a nice addition to your collection. Something you to can be proud of owning. This is an outstanding find in an original fully illustrated 1950's hardware company catalog, whether your into collecting vintage, mid-century, or researching the use of asbestos in vintage products. 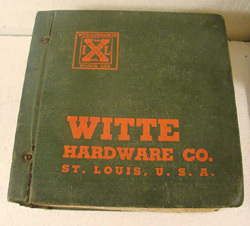 Catalog is from, Witte Hardware of St. Louis, and is a store counter book catalog showing the complete line, pricing, and various brands of items offered by the hardware company.. No actual publication date is listed in the front, General Catalog, No. 434, but did find the date of 1957 on one of the pages This is a big catalog 11-1/2"x 11-3/4" x 4" . Pages are not consecutively numbered my guess is 1500-2000 pages? Includes neat color advertising pages, with most being done in black & white. From the days when a hardware store sold everything, not just tools and hardware. There is even some cool old toys, bicycles, pedal cars, Lone Ranger tents. Winchester and other guns, fishing tackle, lures, transistor radios, watches, neat retro looking clocks, and so much more. Catalog is in very good condition. First couple of pages got crease lines where pages layed over before closing. Some thumbing wear along the edges, (noted when closed up). No major damage or repairs. Some of the products inclosed containing asbestos, range boilers, furnace coils, paper, pipe joint tape, insulating cement. 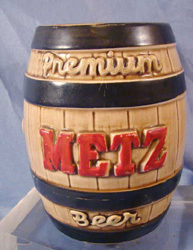 Rare old 1940's Metz Premium Beer promotional advertising premium. Made by the original McCoy Pottery Company for the Metz Brewery Company that was located in Omaha, Nebraska. Heavy stoneware pottery in a barrel shape. Embossed "Premium Metz Beer" on the front. "Metz Brewery Co. Omaha, Nebraska" on the top. Cold paint coloring to the barrel bands and Metz name. Brown glaze overall. Slot in the top, stopper in the bottom. It is 6-3/8" tall. No chips, cracks or repairs. Looks great on display. Some minor rub spots to the cold paint. Overall this is really an amazing Metz Beer advertising piece! 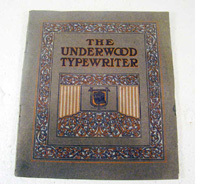 Antique Advertising UNDERWOOD Typewriter Catalogue-Catalog Store Illustrated! Hard to find, original early 1900's Underwood typewriter's sales brochure catalog. Fully illustrated. Price list, details, various models. No. 3, No.4, No. 5, No. 3XW. 8"x 7". 32 pages. Art nouveau influence on cover graphics. Booklet is complete and in very good condition overall. List signs of age, wear. Lite staining on some of the pages. Great old piece for your typewriter, office equipment collection. RARE 1940 Shure Novelty Catalog TRICKS-TOYS- CARNIVAL- PRIZES- DOLLS- ANIMALS. This is one of the best reference catalogs for a variety of collectibles. 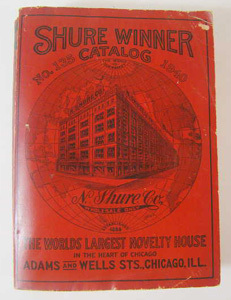 Its an original soft cover catalog for the "Shure Winner" company that sold to wholesale businesses/companies. They were located in Chicago, Illinois and were known for being the "Worlds Largest Novelty House". Fall and Winter 1940-1941. Catalog No. 135. This is a must have for researchers, antiquarian's, and collector's in many categories. 9-1/2" x 7" x 1-1/2". Over 1216 pages, thousands of items, black and white illustrated, with a couple of sections done in color, complete product descriptions and prices. Lots of categories that cover a variety of items. Loaded with about every type of toys that was available that holiday season. From bicycles to dolls to trucks, mechanical toys, to playsets, its all here! Not just toys available that holiday season, there is also ornaments, decorations, candy containers, holiday decor products too. Since this was for wholesale, alot of products show sets, store/counter display boxes, packaging too. The carnival/fair/circus souvenir premiums is quite valuable as you just never see information on chalkware, dolls, stuffed animals, toys, etc....offering the essential of being able to identify and date items. Its not just the premiums, and toys, prizes. Some of the products: knock over the bottle game, animals, chalkware, souvenirs, jokes, china, bisque, novelties. Small listing of other products offered: White metal, miniature toys, tricks, magic, patriotic decorations./ Crickets, bells, whistles, noisemakers. Action toys, ramp walkers. Fisher Price, Tootsietoys, Buddy L, Structo, Marx, Disney, Movie Stars, Cartoon characters, mechanical toys, banks, boats, games. American Flyer, Hafner, trains, sets. Ranger Motor Scooters, bicycles, accessories, pedal cars. Dolls and more dolls, stuffed animals. Christmas; ornaments, decorations, candy containers, light sets. Furniture, globes, smoking stands, lamps (of all kinds), lanterns. Nice selection of bookends. Decorative figures. Unbranded, but there is even high quality Goldscheider porcelain ladies figurines. Variety of Black American items. Great selection of quality fountain pens, pencils, etc. Musical instruments. Camping items, guns, hunting, fishing, sporting goods. Sterling Silver flatware, variety of patterns. Cookware. Cameras, microscopes, telescopes. Lighters, cigarette cases, razors, pocket knives, jewelry, ladies compacts. Clocks, watches, and so much more.... So many sections feature items that have never been published in collector/ price guide books. You'll be surprised by the items that you find and can then go about locating for your collection. Ever heard of a "Jitterbug" ladies watch brooch? The catalog is complete. Indexed in the back for easy reference. Binding fully intact, no loose pages. Soft cover has some edge/corner wear, but not to bad looking overall. Lite roll over from viewing, storage. Overall pages are very nice still, clean free of damage. Stain insidie the top front cover area. A couple pages have a bit of pink staining from carry over of the pink color printed pages in the jewelry section (caused by a spill on the page) . Overall, very nice for a vintage large catalog. Early 1900's San Telmo Cigar Mfg. Co. Figural Cigar Cutter. 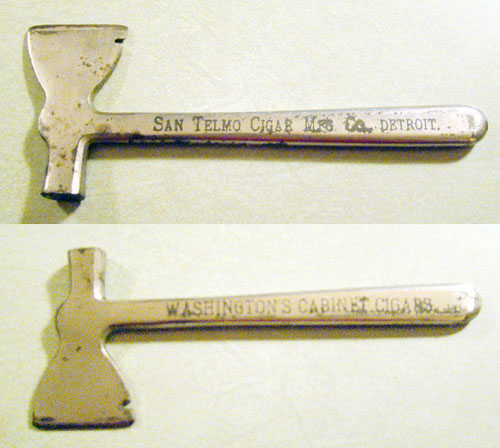 This small heavy metal figural ax cutter was an advertising premium for the San Telmo Cigar Mfg. Company that was located in Detroit Michigan. 6-3/4" long, 2-1/2" wide on the head. Marked on the front. San Telmo Cigar Mfg Co. Detroit, on the other side is advertising for the Washington's Cabinet Cigars, one of the brands that Telmo manufactured. Lite wear to the finsh. Its still sharp on the blade. Rare advertising premium from the early 1900's. REMINGTON TYPEWRITER ADVERTISING MIRROR. !Wonderful old advertising mirror. 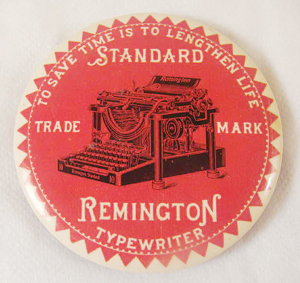 A promotional item passed out by traveling salemen to prospective buyers of a Remington Typewriters. A revolutionary marketing gimmick, instead of passing out calling (business cards) salesmen would pass out things like this pocket mirror with promotional advertising, and found that their sales increased dramatically. This is a nice large 3-1/2" across size mirror. 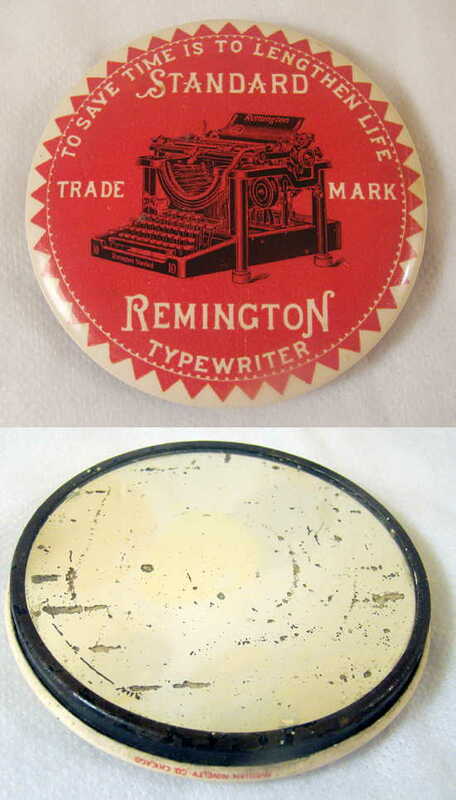 Red, white, black celluloid back depicts the Standard Remington Typewriter along with the motto "To Save Time is To Lengthen Life". Made by the Parisian Novelty Co.-Chicago for Remington, circa. 1910-1920. This premium is in very nice condition overall. Celluloid backing has no cracks or crazing, coloring is still vivid and bright. The mirror is still 'useable' although it does have some loss of the silver backing in spots. The metal ring has toning. This is a unique set of vintage Greyhound Lines toy buses. Promotional souvenirs sold to travelers who passed though a Greyhound bus station/depot back in the 1940's. The kid could play with them on the long bus ride and when they got home, mom and a unique set of salt and pepper shakers to use. 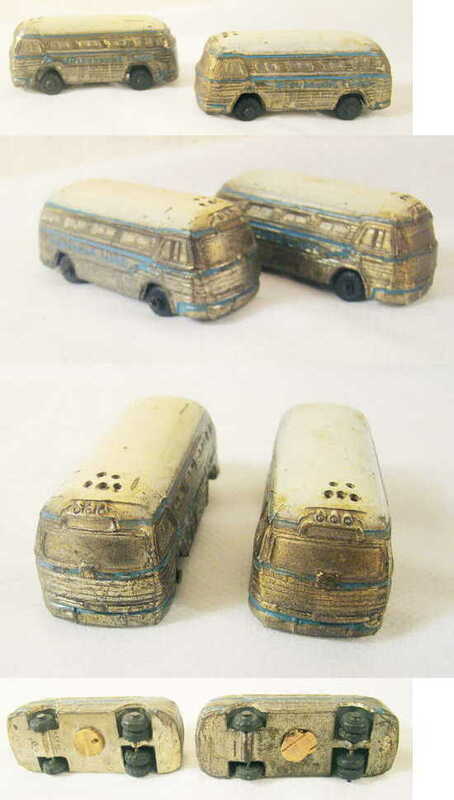 Each is done just like the original toy buses but these are salt and pepper shakers. Nicely detailed, a realistic portrayal of the actual buses that were on the road then. Complete with the Greyhound Line and dogs on the side and free turning wheels just like the toys. Each is complete with its cork stopper in the bottom. Holes on the front top for shaking out the salt and pepper. Each measures 2-3/4" long and 1" wide1-1/8" tall. Lite signs of age and use, no breaks, chips, cracks or repairs. These are pretty hard to find! Don't miss out a nice set to add to your collection. Vintage Furskin Bears Store Display Xavier Roberts Boxd This is a vintage first issue 1985 store display for Xaiver Roberts Furskin Bears. It is complete in its original box with instruction sheet, small poster, banner and hanging mobile. It was displayed in a store to advertise the Furskin bears that they had for sale. The set in in very nice condition still. My pictures don't due it justice as I did not have a place to hang the mobile up and get better pictures. Mobile is heavy cardboard with colorful graphics full round. It has a centerpiece then the four double sided bears swing freely in the rope swings underneath. The large wall banner is 58" x 30-1/2" The poster measures 22" x 18" unfolded. This set is the Original Appalachian Artwork display and is not seen very often due to is limited production. 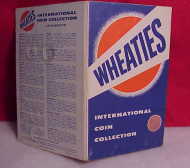 WHEATIES INTERNATIONAL PREMIUM COIN SET W/FOLDER! Foreign coins put out by General Mills Corp.of Minneapolis, Minn. for Wheaties (cereal ) in the 1950's. This set is complete in it's original folder. This set consist of 15 unique foreign coins of the world. All are uncirculated. Darkened patina. .Lite wear to the folder. 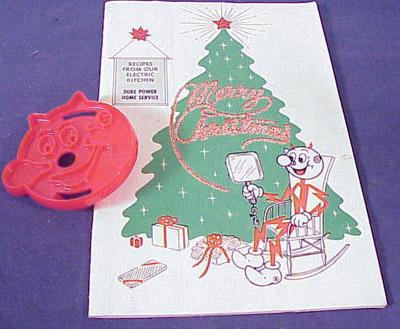 Vintage REDDY KILOWATT Cookie Cutter & Cookbook Duke Vintage 50's/60's advertising icon Reddy Killowatt figural cookie cutter, and cookbook. The red hard plastic cookie cutter is marked Reddy Killowatt, made in USA on the back. It is 3" across and in excellant condition. The Cookbook features cute Christmas scenes with Reddy Killowatt on the front and back covers. 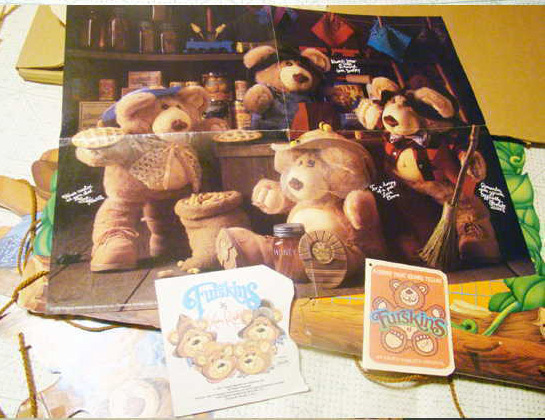 It was published for Duke Power and contains recipes from employees of the Power Company. Its complete and in good condition overall. Lite crease line from being folded. 9" x 6". 24 pages.